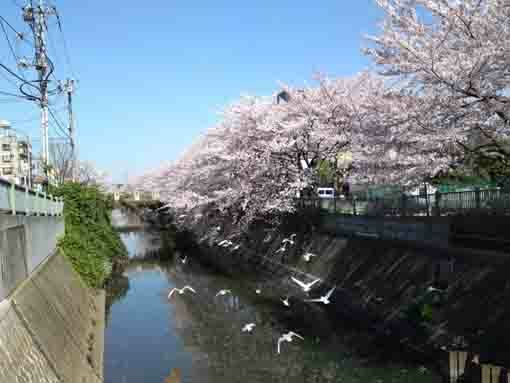 Oogashiwagawa River begins Funagashi and Kamagayashi, and it enters the northern part of Ichikawashi and joins Mamagawa River, then it goes to the south and finally it reaches at Tokyo Bay. 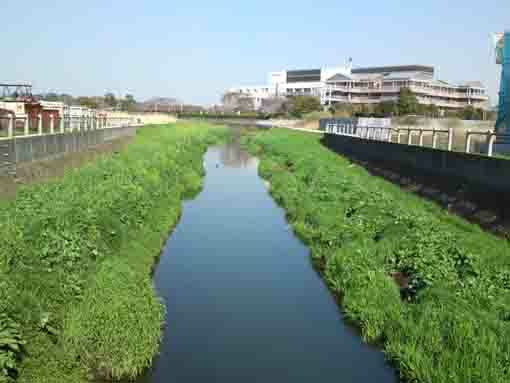 But it had gone to Urayasu in Edo period, at that time it was called Takumibori or Jotenbori Canal since Takumi Tanaka in Urayasu and Joten Kano in Gyotoku had worked together to dig a 12 kilo-meter long canal for irrigation. 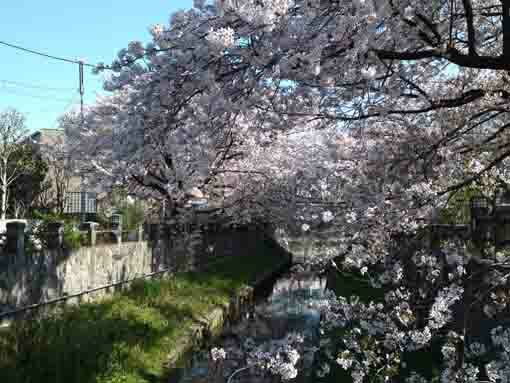 This canal could bring much fresh water from some springs in Kamagayashi, Hayashimizu Spring is the famous one. 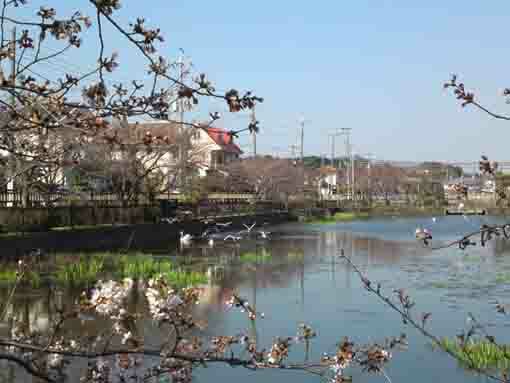 Water from Hayashimizu and others becomes Nakazawagawa River that go through the southern part of Kmamagayashi and it meets Futawagawa River, and also water from a spring near Kaigarayama Park in Kamagayashi becomes Negogawa River and it joins Nakazawagawa, then it changes name to Oogashiwagawa River and goes into Ichikawashi. 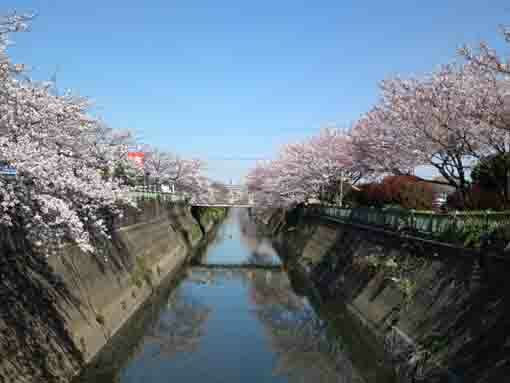 It is the very important canal to connect people living in Kamagaya, Ichikawa and Urayasu in Edo period. 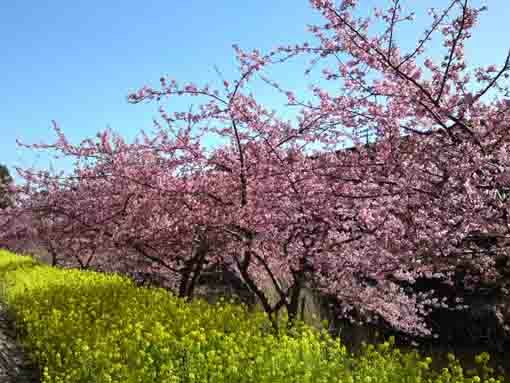 In spring, over 3 kilometers long lined cherry trees along Oogashiwagawa River bloom excitingly and decorate brightly the river. 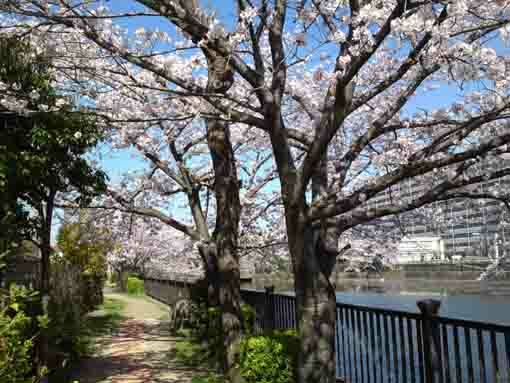 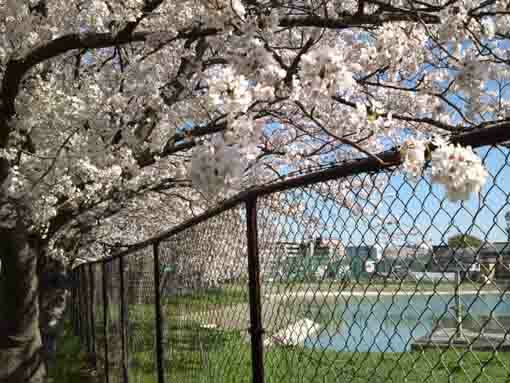 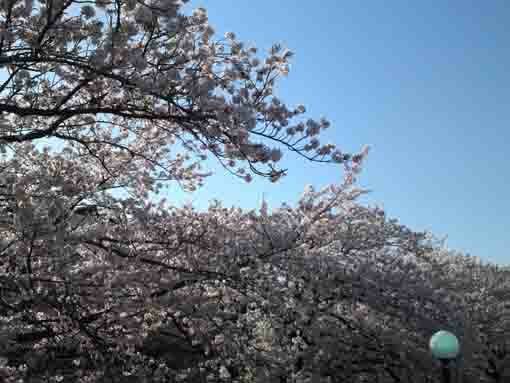 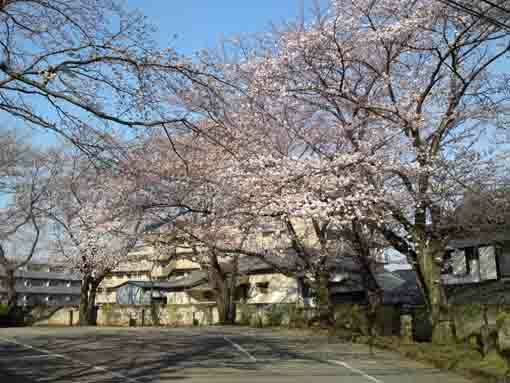 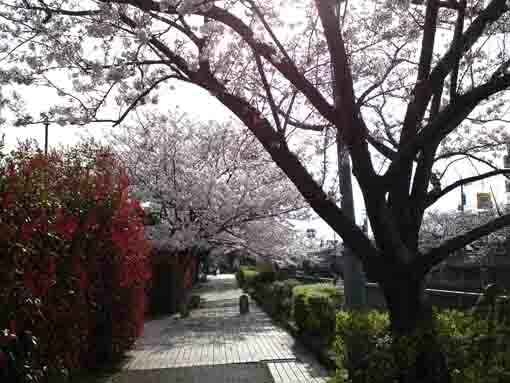 Moreover, there are some nated spots for seeing cherry blossoms near the river. 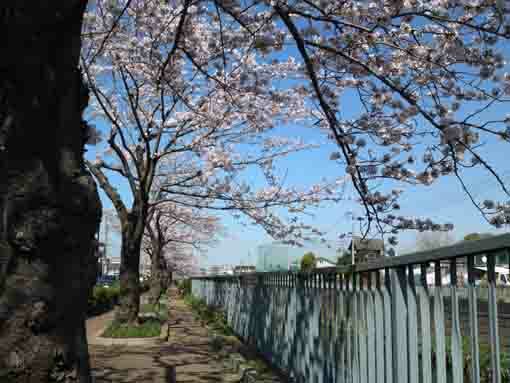 And there are many temples existing along Takumibori Canal even now, and also the 33 pilgrimages in Gyotoku and Urayasu has existed now. 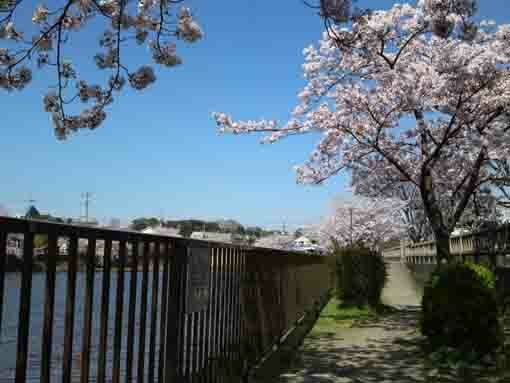 Oogashiwagawa river has contributed to make local history and culture is a wonderful river for walking along. 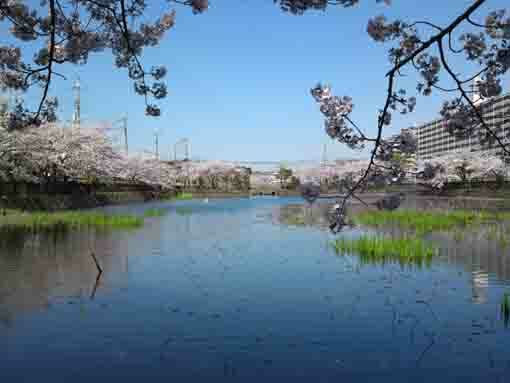 Why don't you visit Oogashiwagawa River? 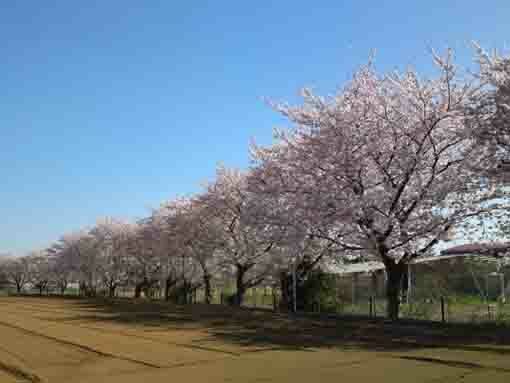 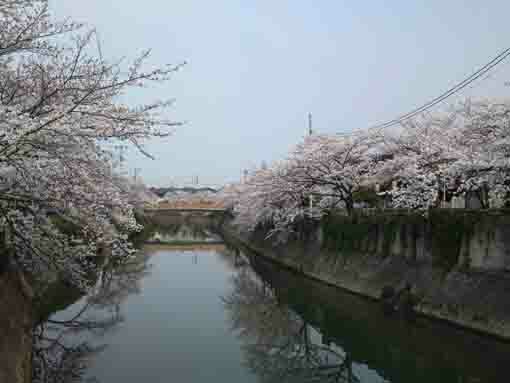 The longest line of cherry trees in Ichikawa City decorate Oogashiwagawa river in spring beautifully. 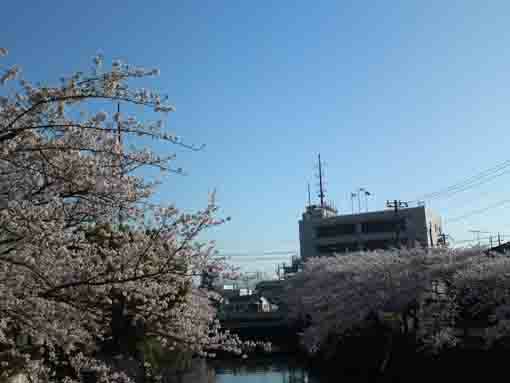 The cherry blossoms look special beautiful from Motokitakagabashi to Rokufaribashi Bridge. 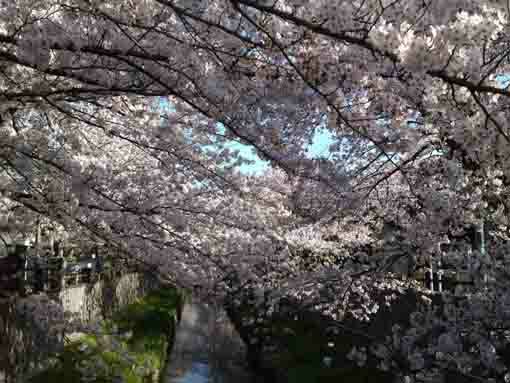 Visitors could enjoy seeing them while they are passing through the tunnel of the cherry blossoms. 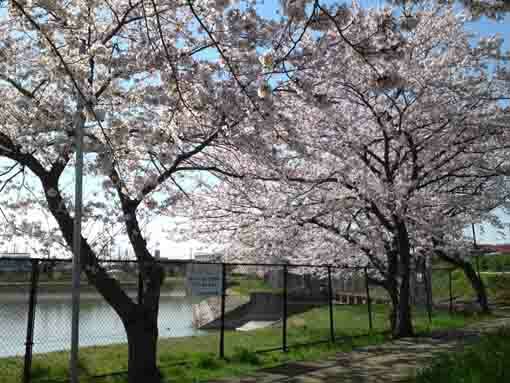 Some noted spots for seeing cherry blossoms along Oogashiwagawa river are not popular, cherry trees planted along the road to Ichikawa Higashi High School is the one of them. 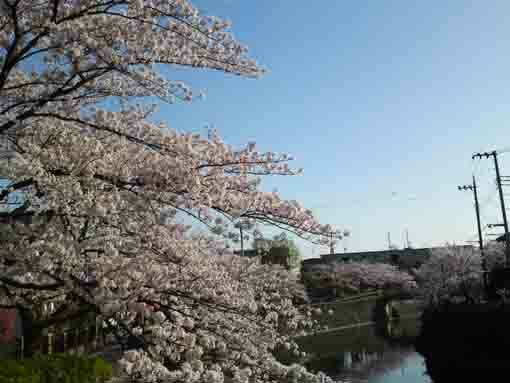 Passing Kainohanabashi Bridge over the river and going to the east, there is a lined cherry trees along the road. 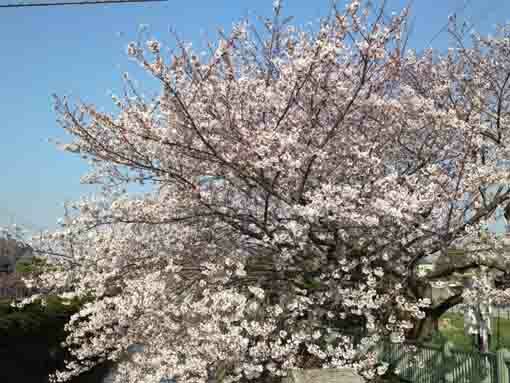 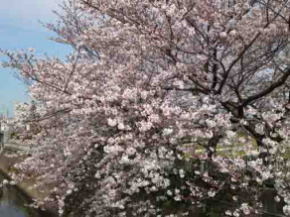 In spring, a wonderful sight with beautiful cherry blossoms opens there. 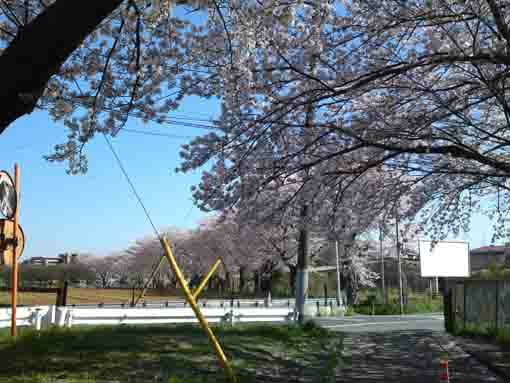 Going to the road going along the lined cherry trees in front of the gate of Ichikawa Higashi High School and passing through a pond, there is a large tiled roof covered with cherry blossoms over a athletic ground. 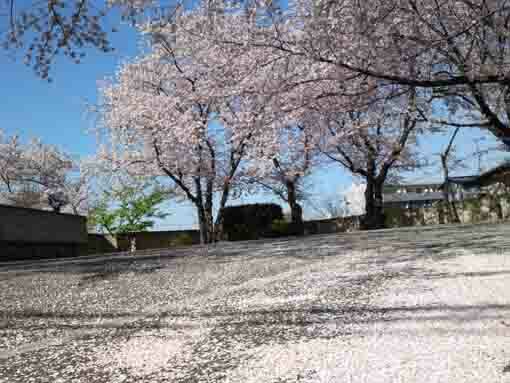 It is in the Myoshoji Temple famous for the scared land of cherry trees. 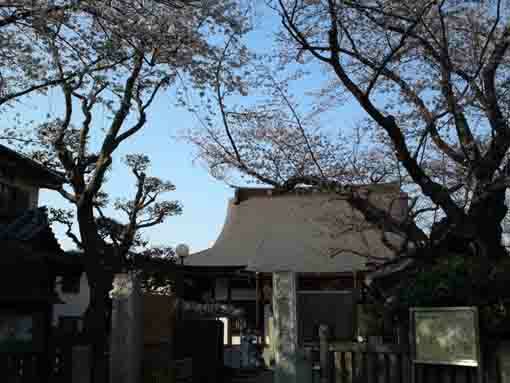 And it belongs to Ichikawa Shichifukujin (the seven gods of good fortune). 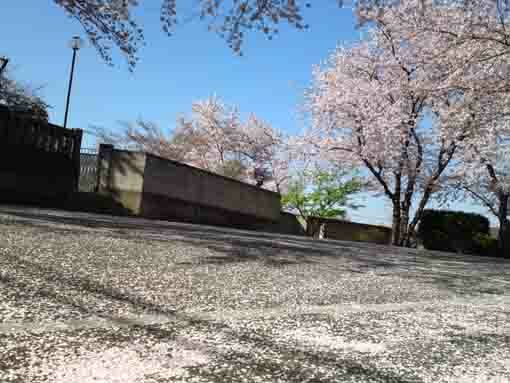 It is dramatically beautiful when millions of white petals of cherry blossoms scattered on the ground of its parking lot. 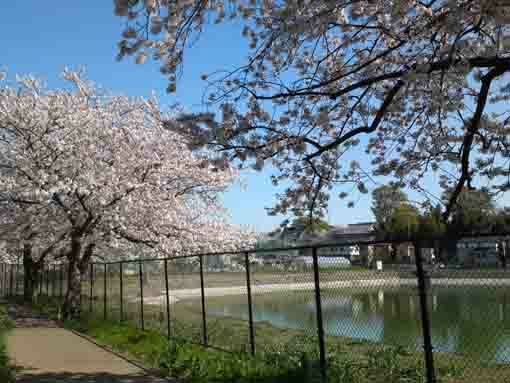 Kozato Koen Park in the residential area on the west of Oogashiwagawa River has two ponds surrounded many cherry trees. 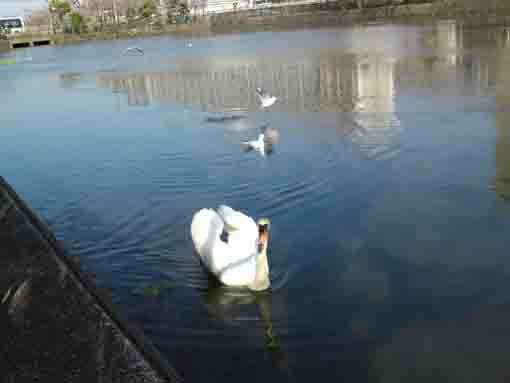 And many waterfowls including swans live in the ponds. 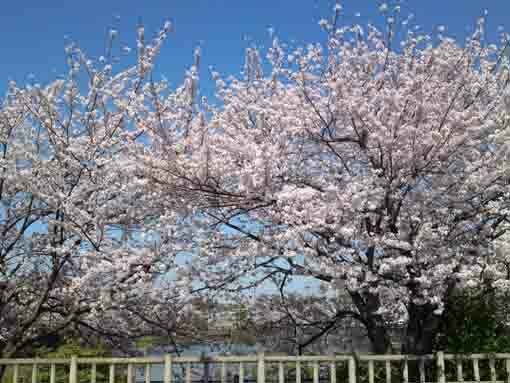 In spring, millions of cherry blossoms beautifully bloom around the ponds. 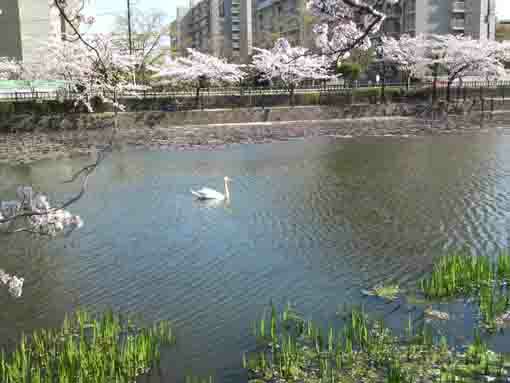 Swans and waterfowls swim the ponds under the cherry blossoms in the blue sky. 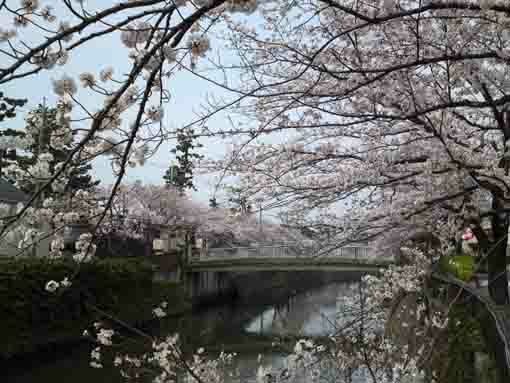 Mamagawa joining Oogashiwagawa River is one of the most popular spots seeing beautiful cherry blossoms. 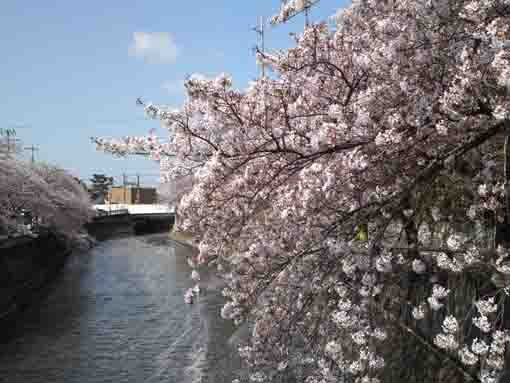 Not only water flowing in Oogashiwa river but also cherry blossoms along the river joins Mamagawa River. 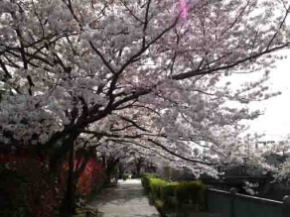 Take 3 minute walk from Onigoe Sta. 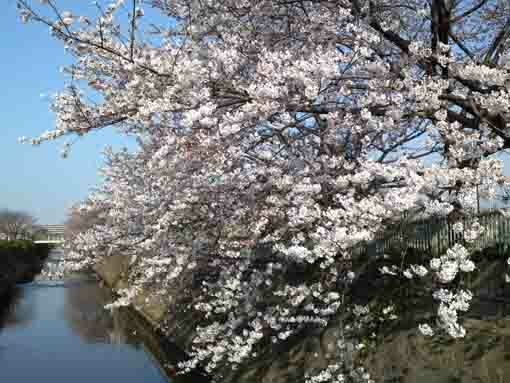 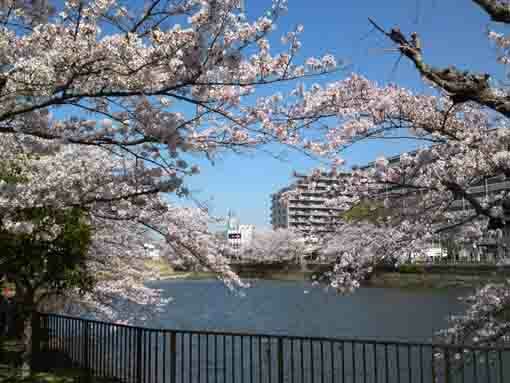 After seeing cherry blossoms along Mamagawa River, please go on to see them along Oogashiwagawa River. 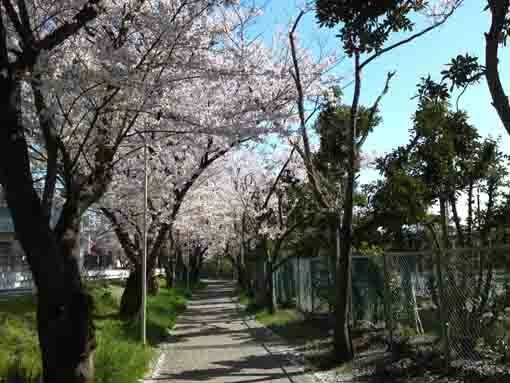 Take 23 minute walk from Funabashi Hoten Sta. 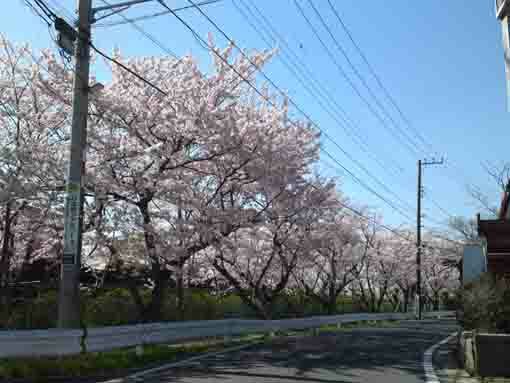 It is very enjoyable for you after seeing cherry blossoms in Myoshoji and along the approach roads to Ichikawa Higashi High School. 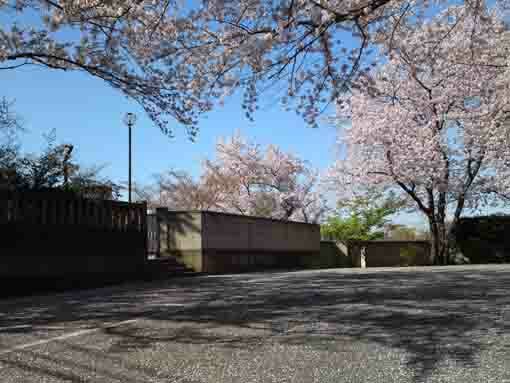 Take 13 minute walk from Ichikawa Ono Sta. 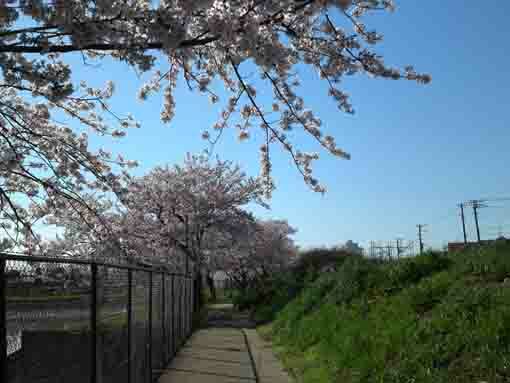 It is very satisfying for you after visiting Kozato Park. 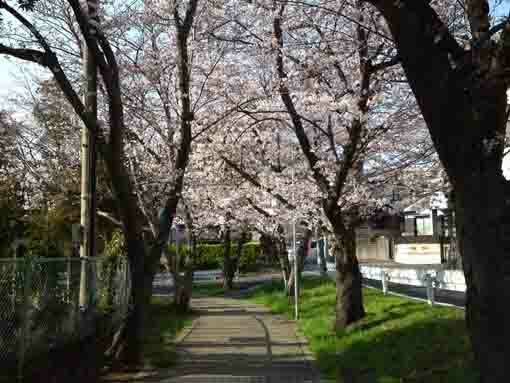 Take 13 minute walk from Funabashi Hoten Sta. 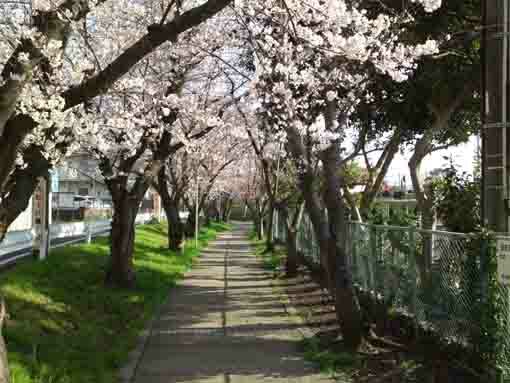 Take 15 minute walk from Ichikawa Ono Sta. 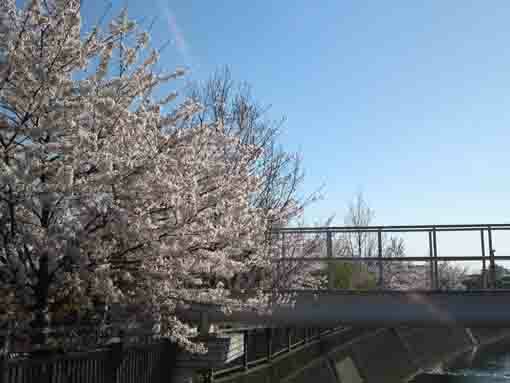 From Narita International Airport, take JR Sobu-express line, transfer the line at Nishi-funabashi to Musashino Line bound to Fuchuhoncho or Higashi Tokorozawa, get off Funabashi Hoten Sta. 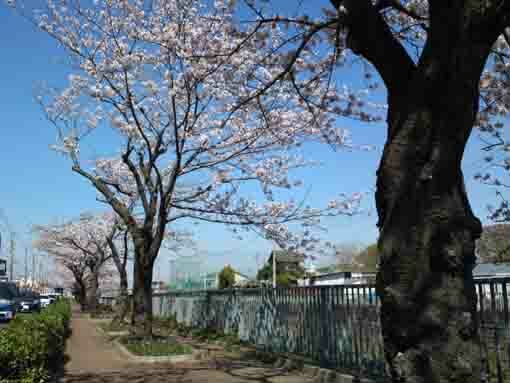 And also take Hokuso Line, transfer the line at Higashimatsudo to Musashino Lline, get off Funabashi Hoten or Ichikawa Ono Sta. 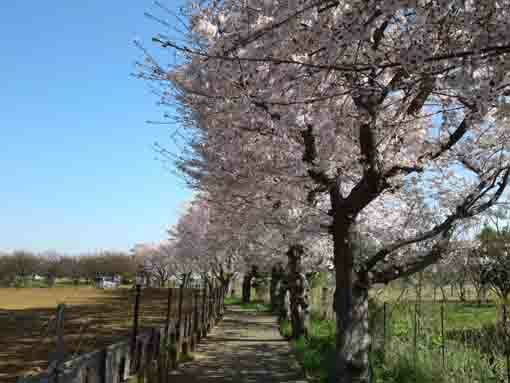 It takes minimally 50 minutes from Narita Airport. 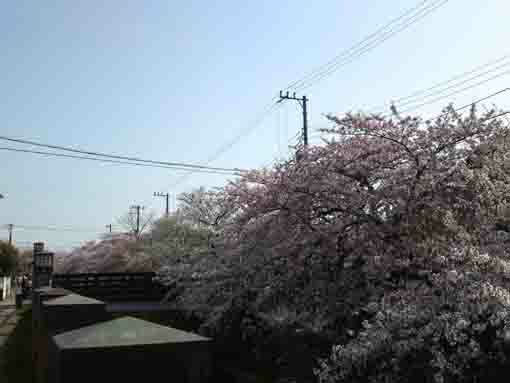 From Haneda International Airport, take Keikyu-line bound to Narita, transfer the line at Takasago Sta to Hokuso Line, and transfer the line at Higashi Matsudo Sta to Musashino Line, get off Funabashi Hoten or Ichikawa Ono Sta. 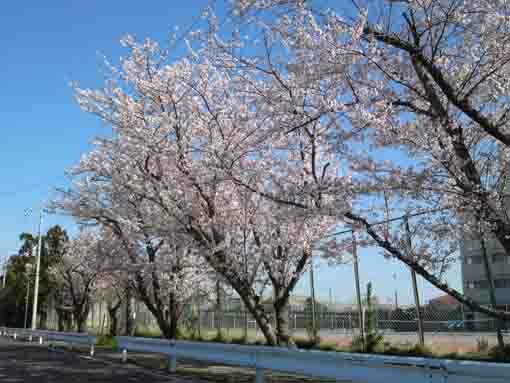 It takes almost 1 hour from Haneda Airport. 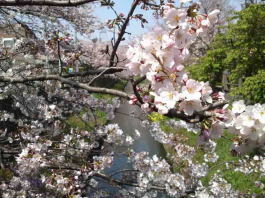 From Tokyo Sta, take Musashino Line bound to Fuchuhoncho or Higashi Tokorozawa, get off Hunabashi Hoten or Ichikawa Ono Sta. 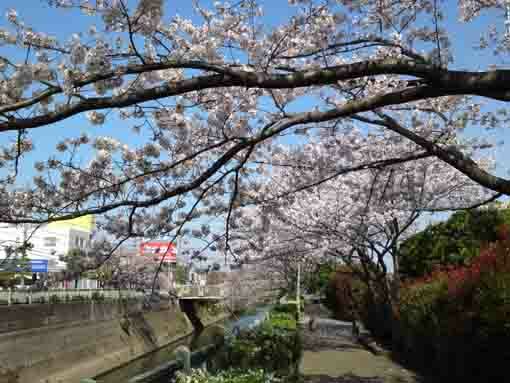 It takes about 25 minutes from Tokyo Sta. 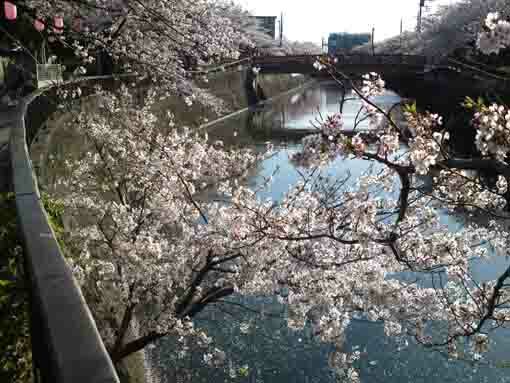 From Akihabara Sta, take Sobu line bound to Chiba, Tsudanuma or Nishi Funabashi, Ttransfer the line at Nishi Funabashi to Musashino Line bound to Fuchu Honcho or Higashi Tokorozawa, get off Funabashi Hoten or Ichikawa Ono Sta. 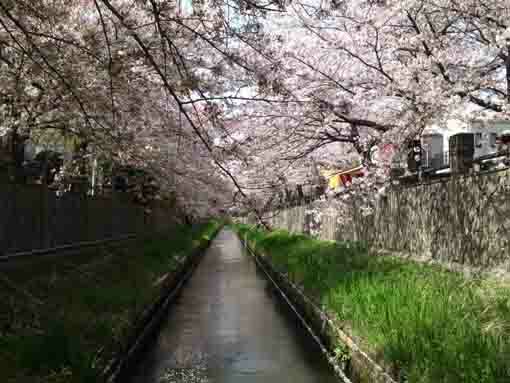 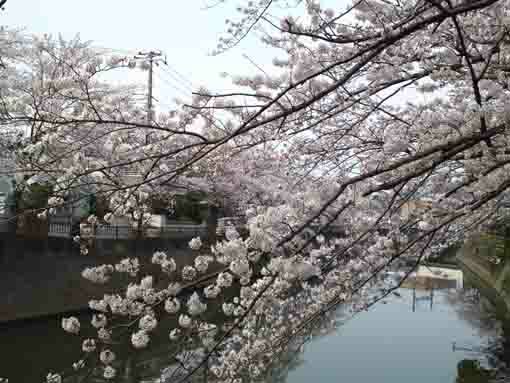 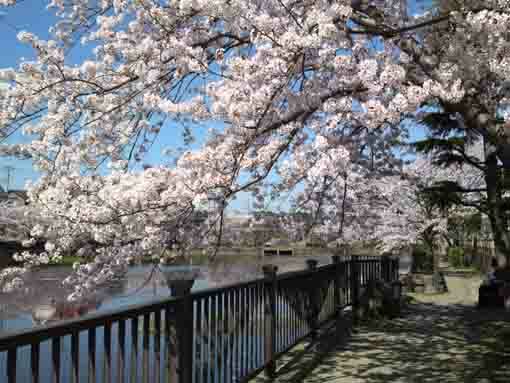 In spring, over 3 kilometers long lined cherry trees along it bloom and decorate brightly the river. 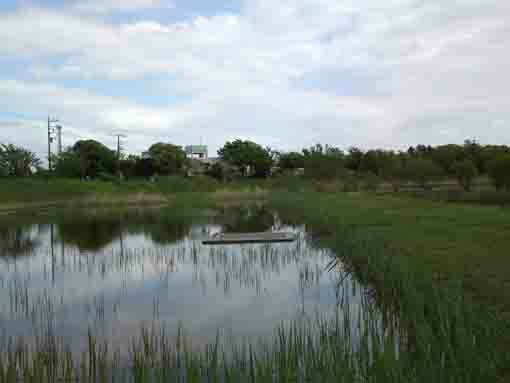 Some wild birds and plants live in this water park. 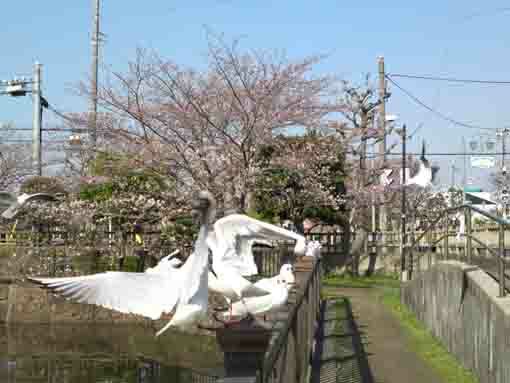 Many wild birds and waterfowls fly to the ponds surrounded by many cherry trees in the park. 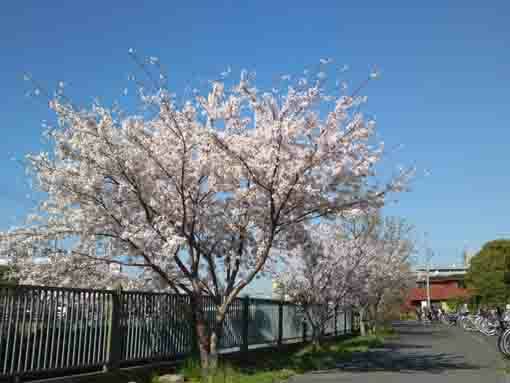 Spring is the best season. 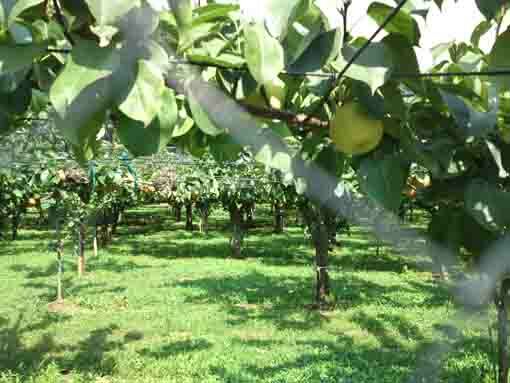 There are many pear gardens in Oono and Omachi. 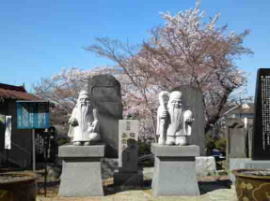 And also many legends connecting to Masakado Taira and Nichiren remain there. 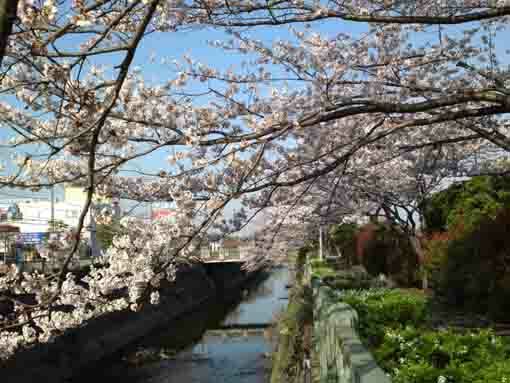 Mamagawa River is a famous spot to enjoy seeing cherry Blossoms. 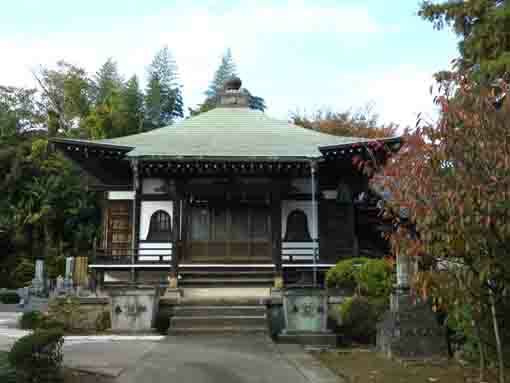 Gyotoku has many historical landmarks related to Edo and has Niihama Yacho no Rakuen.